The Sotiris Studios Apartments Hotel Ammes is a family run 3-star boutique hotel located 200 m from Ammes Beach and 150m away from a market and bus stop in the Svoronata, Kefalonia. Featuring an outdoor swimming pool with sun loungers and patio, a garden and a poolside bar the hotel is a relaxing retreat amidst all modern amenities and warm hospitality. Rooms at the hotel are bright and simply furnished, offer amazing Ionian Sea views from their balcony, and are equipped with a kitchenette that has mini fridge, coffee maker and kettle. The en-suite bathroom comes with a hairdryer. Free parking is available on the site. The friendly and helpful staff offer a family atmosphere and warmth to guests. Sotiris Studios Apartments Hotel Ammes is located 200 m from Ammes Beach and 150m away from a market and bus stop. Ammes beach is located at Svoronata at the edge of Kefalonia Airport and just 9km away from Argostoli. The beach is a sanctuary of fine sand and crystalline waters. Many hotels, apartments, restaurants and cafes line the beach. Being so close to the airport, guests can have great views of the planes landing and taking off overhead, though it can be slightly noisy. This is particularly favoured by visitors travelling with families, because the beach is shallow and good for kids to swim. The beach has public conveniences like parasols and loungers and has good bars and tavernas. The Rhodes International Airport is at 7km distance. Sotiris Studios Apartments Hotel Ammes has guestrooms spread over two apartment blocks, of which one is recently refurbished. The immaculate air conditioned guestrooms have a safe and basic furniture and come with a kitchenette that has mini fridge, coffee maker and kettle. The en-suite bathroom comes with a hairdryer and W/C. The attached balconies offer wonderful view of the pool area. There are 7 one-bedroom apartments (accommodating 4-5), 20 rooms for 3 guests and 6 rooms for 2 guests. All of the rooms hold either a pool or sea view. 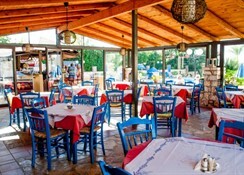 The on-site restaurant at The Sotiris Studios & Apartments Hotel offers freshly cooked and delectable seafood, the swordfish steaks served here are heavenly. It also serves fresh and healthy Greek salads. There is a lovely bar where guests can relax with a cocktail, the barmen make for cheerful conversation and local tips. Sotiris Studios Apartments Hotel Ammes has a swimming pool and kids’ pool and terrace where guests can soak up all the sun. The terrace is decked up with sun loungers and umbrellas. The hotel offers shuttle services to the beach. There is a lovely bar to relax with cocktails. Family rooms garden Sun umbrellas Outdoor pool (seasonal) Swimming pool Miscellaneous Sun terrace Sit back and relax Bar Restaurant Shuttle service Shuttle service (additional charge) Car hire Cleaning services Daily maid service Laundry (Additional charge) Free! WiFi is available in public areas and is free of charge. Free private parking is possible on site (reservation is not needed). Great value apartment, adequate kitchen equipment for self catering. Large comfortable double bed in separate bedroom, plus two basic singles (not very comfortable!). Cleaned every two days, bins emptied daily, sheets changed weekly, towels more often as needed. Bar, restaurant, pool. Friendly helpful staff. Quiet area, 5 minutes walk to beautiful beach, bus stop and taverna. Mini market, car hire and good taverna a few minutes walk inland. Two more tavernas along coast road. 25 minutes walk from airport. Balcony with partial seaview.